The Newton County Schools was a big project for the Sustainable Investment Group (SIG) this year. It was the first full school portfolio that we benchmarked. The Newton County Schools consist of 25 buildings, including elementary schools, middle schools, and high schools. The ENERGY STAR scores that we generated for the Newton County Schools ranged from 63 to 96. Out of these 25 buildings, 23 were benchmarked and all but three buildings were eligible for ENERGY STAR awards. The rest of the schools had scores higher than 75, meaning that the majority of the Newton County Schools are among the top ENERGY STAR performers and are eligible for ENERGY STAR certification. These eligible schools are pursuing their ENERGY STAR certification, and if they achieve certification, the schools will be formally recognized as schools that use less energy, cost less to operate, and create fewer greenhouse emissions compared to other K-12 buildings. 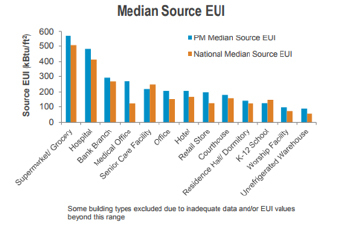 In addition to the high ENERGY STAR scores, the Newton County Schools also have Source Energy Use Intensity (EUI) values that are around the national median. EUI is the measurement that ENERGY STAR uses to calculate their scores. The median Source EUI of the benchmarked schools is 122.9 (kBtu/ft²) which is close to the Median Source EUI value for all K-12 Schools. This means that a high number of schools are energy efficient, but there are still schools that are in need of energy-efficient improvements. Newton County Schools’ energy efficiency is most impressive because schools by nature do not require as much energy to operate as other building types such as grocery stores, hospitals, banks, office buildings, retail stores, and senior care facilities. In other words, energy efficiency among schools can be considered competitive, and therefore, Newton County Schools are a top competitor in terms of energy efficient. © 2017 Sustainable Investment Group (SIG). All rights reserved.